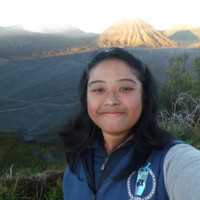 Talitha is our Destination Expert in Indonesia. Day 3: Enjoy a boat & cycling tour through the beautiful landscape in and around Samosir. Day 6: Visit Bohorok and its Orang Utan rehabilitation centre in Gunung Leuser National Park. 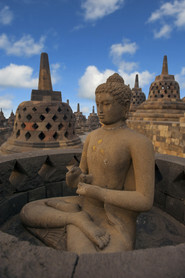 Day 9: See one of the largest Buddhist sanctuaries in the world, the Borobudur. Day 14: Your choice – trekking around Ubud’s rice fields, white water rafting or spa treatments. You want to experience Indonesia at its best? Then this 21 day round trip leads you to Sumatra's, Java's and Bali's beautiful landscapes, cities and temples. Visit the locals, go to the market and enjoy the easy way of life on these islands. No time to be bored, because you can also visit vivid cities like Yogyakarta. 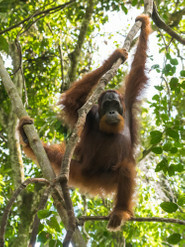 Get closer to Orang Utans in the jungle and elephants near the rivers. A last important excursion during your trip are the three relaxing days at the beach of Sanur. Enjoy your holiday! Upon arrival at Medan airport, your guide will will pick you up and he will join you in a short tour of the city of Medan. You will visit the Maimoon-palace, built by the sultan of Deli, the colonial post office and the black domed Mesjid Raya (Grand Mosque). Note: when you arrive in afternoon you will go straight to your hotel and skip the city tour. Via the plantation route you are led to the island Samosir, situated in the centre of Lake Toba, one of the largest and deepest lakes in Southeast Asia. Toba has developed into a full-featured highland resort while retaining its rustic charm and relaxed ambiance. Depart in the morning by boat (bicycle is loaded on the boat) to Simanindo to see the Batak Dance & Traditional House. You continue by bicycle from Simanindo to Ambarita, passing through the rice-fields and small villages and stopping for a tea break. In Ambarita you will see the stone chair and stone table that belonged to King Siallagan. From Ambarita to Tomok village you will use the boat again. In Tomok you will see the tomb of King Sidabutar. You can choose either to cycle back to the hotel or going back to hotel by boat. On today's route you stop at a traditional Karo Batak Village, at Simalungun King’s Palace and at the Si Piso Piso waterfall. In the afternoon you cross Lake Toba with the local ferry to Berastagi. The small town does not rely on tourism so you'll find many opporunities to talk to the locals. Today you will leave Berastagi and in approximately 8 hours you will reach Bukit Lawang. En route you will see many palm oil and rubber plantations. If you like you can stop to take a closer look. Bohorok is most famous for its Orang Utan rehabilitation centre in Gunung Leuser National Park. Upon arrival you can go for a nice walk in the surrounding area or just relax on the porch of your hotel facing the river. Wake up early to visit the Orang Utan Rehabilitation Center where formerly captive apes are re-introduced into the wild. A local guide will take you on a 2-hour walk into the tropical rainforest. Alternatively you can take part in a three to four hour walk in the vast Gunung Leuser National Park. This rainforest park is one of the best accessible national parks in Indonesia. Then you will drive back to Medan and check into your hotel. Transfer to the airport for your flight to Yogyakarta. Upon arrival at Yogyakarta Airport, your guide will meet you and transfer you to your hotel. Yogyakarta is a great place to be for a few days. It's a colorful city with a nice atmosphere. Today you will experience Java's rich culture. First you will visit the Sultan's Palace, with its grand elegant Javanese architecture, in the centre of Yogya city. It was built in 1755 by Prince Mangkubumi. The next stop on your tour is the famous Prambanan Temple complex, that consists of 224 temple ruins. The Hindu temple complex is of stunning beauty, and devoted to the gods Brahma, Shiva and Vishnu. 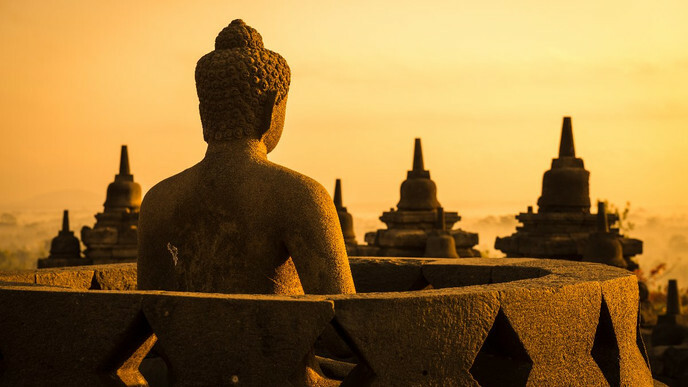 In the morning you will visit one of the largest Buddhist sanctuaries in the world, the Borobudur. This famous temple dates back to the 8th and 9th century. Borobudur was found by a king of the Saliendra dynasty, it was built to honour the glory of both the Buddha and its founder. The temple was constructed in three tiers: a pyramidal base with five concentric square terraces, the trunk of a cone with three circular platforms and, at the top, a monumental stupa. The monument was restored with UNESCO's help in the 1970s. The name Borobudur is believed to have been derived from the Sanskrit words vihara Buddha uhr, meaning the Buddhist monastery on the hill. A transfer will bring you to the train station, where your train to Mojokerto is waiting. On arrival, our driver will meet you and you will drive to the Bromo volcano via Probolinggo. Here you will stay overnight in Cemoro Lawang, right on the outside edge of the Tengger crater. Your stay in Bromo, and the ascent to the top of the crater will certainly be a highlight of your trip. An early rise (4.00 am) will ensure you have enough time for the jeep ride to the viewpoint up above for the incredible experience of sunrise over Mount Bromo. Arriving in the dark, watch as the sun breaks the horizon to reveal Java’s most awe inspiring landscape. Find yourself standing on the razor’s edge of Mount Bromo’s active crater. As Bromo smoulders beneath your feet, the full scale of the terrain slowly becomes apparent as night becomes day. In the foreground an eerie inland sea of sand, is dotted by the forms of local horsemen kicking up dust trails in their wake, as they gallop across the volcanic plains. After your return to the hotel you can take your time for a tasty breakfast an some leisure time until your drive to Surabaya. Today your car and tour guide is available to explore Surabaya city, or you may relax at the hotel. Surabaya is the capital of the province of East Java. Until approximately 1900, this was the most important seaport of the archipelago. The most interesting parts of Surabaya are the old Arab and Chinese neighborhoods on the north side of the city, not far from the port. Here you can stroll through the narrow streets near the mosque, where many stalls stand with hand-woven fabrics from all parts of Java. Transfer to the airport for your flight to Bali. On arrival at Ngurah Rai International Airport, your guide will transfer you to Ubud. Ubud is famous for its regularly nightly traditional dance performances, which are part of the traditional culture and are arranged for tourists on a regular schedule. Hindu-Balinese ceremonies take place on a nearly daily basis. A wide range of optional excursions is possible for exploring Ubud and its surroundings. Interesting temples and palaces as the Elephant Cave, Tampak Siring, Tirta Empul, or the famous Pura Besakih (the mother temple) and Kintamani are only a few of the interesting sights to visit. Trekking around Ubud’s rice fields, white water rafting and spa treatments are also available. An optional bike tour brings you through remarkably beautiful countryside. Try it! Further explore Ubud and its surroundings. Interesting dance performances in former palaces or temple ceremonies are worth a visit. And last but not least, the many galleries in and around Ubud offer all handicrafts and arts. Today is the right day to relax and discover the best restaurants in Ubud. Get a massage at the hotel or have a walk to the market. Today you will be transferred to the cosy beaches of Sanur, where you will spend your last night of this trip in a hotel with swimming pool, nearby the beach. Enjoy a glass of wine and a nice dinner in the warm evening sun. You have many options: You will have the opportunity to visit Bali’s south coast highlights. You may visit Uluwatu – an impressive temple built on a rock with a straight drop of 250 feet situated at Bukit Pecatu. Sanur also has a wide range of excellent restaurants as well as a nice and quiet beach. Enjoy this day at the beach and let the sun shine down on you. It is protected by a reef and breakwaters, so the water is limpid. Relax one last day at the beach or go for some exciting activities like snorkeling or cycling. Look out for a good spot to enjoy the last sunset of your trip. After a last breakfast at the hotel, the transfer will bring you to the airport. Curious how your next destination will be or do you prefer to go home?